Last year Mgr Loftus let us off his reflections on the Resurrection of Our Lord. I did a critique of his ideas from earlier years here. Any idea that this reprieve might have been because he thought better of airing his peculiar views has been dispelled by this year's effort. It is so strange and difficult to understand - not to say incoherent - that to be fair to him I have retyped it and put the whole thing up here. Here is a key section from the middle. More analysis to follow when I've more time. Perhaps the single biggest obstacle to our unwrapping of the Easter gift of glorification from its wrapping-paper of empty tomb, post-Resurrection appearances with lakeside picnic, and the walking though closed-doors, as well as the Cape-Canaveral-like finale of the Ascension, is the difficult we have in grasping the reality of the purely spiritual. There is no physical reality about the Risen Christ, only, as St Paul tells us, a real 'spiritual body' appearing 'in the guise of' something else, whether it is a gardener to Mary Magdalene, or a fellow pilgrim to the disciples on the road to Emmaeus. The reality is the glorification, and that is purely spiritual. And it is that spiritual, glorified body, not a physical body occupying time and space, which is also under the appearances of bread and wine in Holy Communion. Through Faith we are enabled to unwrap the spiritual, non-physical reality of a Christ's body, blood, soul and divinity from the appearance of bread and wine at Mass. But that body is Christ's glorified body. It is not physical. It does not occupy space within the host, within the world, within heaven. Indeed, as Pope John Paul II reminds us in the Catechism, heaven is anyway not a 'place' that anyone could occupy. There are, as St Paul assures us, "many dwelling-places" in heaven - plenty of 'room' for all of us, but only because the reality of our risen and glorified bodies, like that of Christ himself, will be a spiritual reality, not requiring space. And because the purely spiritual does not require time either, we live in that glorified state for ever. It's not that eternity lasts for a long time - it has nothing to do with time. My first comment here would be that, obviously, there is something physical about the resurrection because the body disappeared from the tomb. The corpse was involved - it wasn't left behind. ...Christ is present whole and entire in His physical "reality," corporeally present, although not in the manner in which bodies are in a place. But this is only to scratch the surface of the lunacy here. Just to get our feet back on the ground this is the Catechism on the subject of the Resurrection. 645 By means of touch and the sharing of a meal, the risen Jesus establishes direct contact with his disciples. He invites them in this way to recognize that he is not a ghost and above all to verify that the risen body in which he appears to them is the same body that had been tortured and crucified, for it still bears the traces of his Passion. Yet at the same time this authentic, real body possesses the new properties of a glorious body: not limited by space and time but able to be present how and when he wills; for Christ's humanity can no longer be confined to earth, and belongs henceforth only to the Father's divine realm. For this reason too the risen Jesus enjoys the sovereign freedom of appearing as he wishes: in the guise of a gardener or in other forms familiar to his disciples, precisely to awaken their faith. 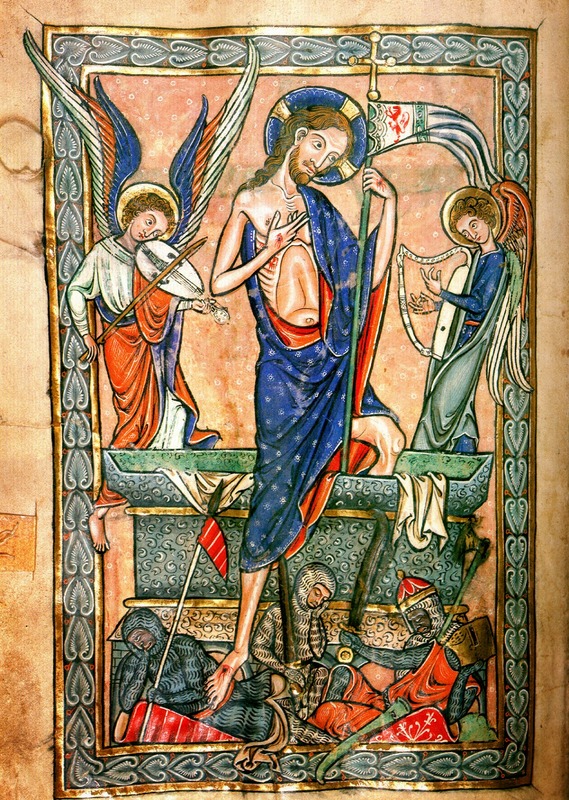 646 Christ's Resurrection was not a return to earthly life, as was the case with the raisings from the dead that he had performed before Easter: Jairus' daughter, the young man of Naim, Lazarus. These actions were miraculous events, but the persons miraculously raised returned by Jesus' power to ordinary earthly life. At some particular moment they would die again. Christ's Resurrection is essentially different. In his risen body he passes from the state of death to another life beyond time and space. At Jesus' Resurrection his body is filled with the power of the Holy Spirit: he shares the divine life in his glorious state, so that St. Paul can say that Christ is "the man of heaven". What Loftus refuses to do is affirm para 645 when placing all his emphasis on the sort of thing noted in para 646. It is scandalous and misleading because it is unbalanced. In all his writings on the subject I have seen, he can never bring himself to affirm the earlier paragraphs. It is hard not to conclude that he doesn't believe them. When the late Professor John Senior was asked why he attended an SSPX chapel (in the days when it was commonly believed they were in formal schism), he replied "If Weakland is in, whose out?" I think the same statement could be applied to this character. Mgr Lofthouse is in desperate need of catechesis as he doesn’t seem to understand the Catholic faith nor Sacred Scripture. Jesus says in St Luke Chapter 24:39 “See my hands and feet that it is I myself. Handle and see for a spirit hath not flesh and bones, as you see me to have. Perhaps Mgr Lofthouse should attend a good RCIA course – as a student. I really hope the Church will leap back from this current state of affairs and that this is not the final descent to the final judgement just yet. There's a rumour that Mickens has definately got the sack as Rome correspondent of the Tablet. What about Basil? That would be a laugh! On second thoughts, no. It wouldn't be good for your blood pressure, Joseph! Yes, it is true about Mickens, it was announced in last weekend's Tablet. If he does not accept the physical resurrection of Christ's Body, where does he think the physical remains are? Does this mean that he also denies the resurrection of our bodies? He doesn't sound like a Catholic to me.